Today I am sharing my Ice Cream Lovers Gift Guide with my lovely readers on this day of Friday Faves. Are you an ice cream addict? I sure am and especially this time of year with summer approaching. I honestly could eat ice cream or frozen yogurt every single day, I love it that much! 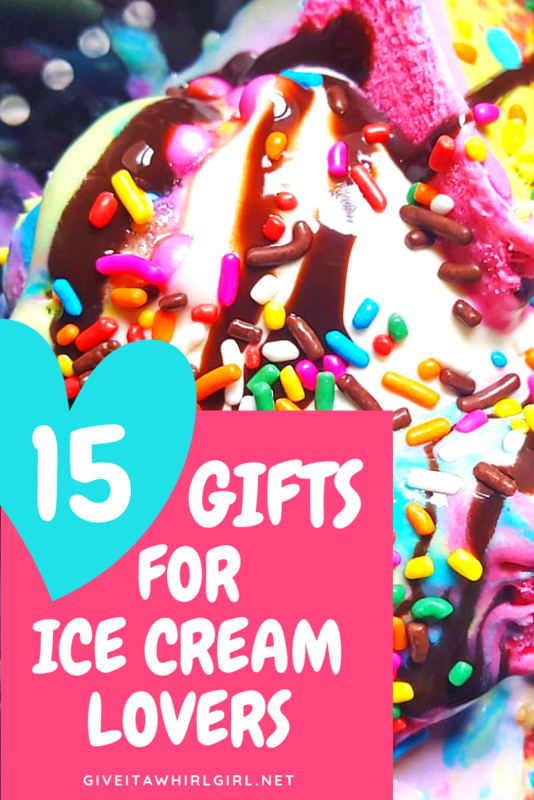 This Ice Cream Lovers Gift Guide is chock full of all the ice cream goodies that your heart (and tummy) desires! I have included ice cream dishes, spoons, ice cream makers, candy sprinkles and more! Keep reading my ice cream gift guide and tell me what products you will be giving a whirl! No ice cream lovers gift guide would be complete without the basics. I have included some ice cream dishes, ice cream spoons, ice cream makers and more! In the comment section feel free to let me know what ice cream items you will be adding to your Amazon wishlist! This set of ice-cream bowls from Greenco is the perfect dessert bowl set for your next frozen treat! This set of 12 also includes some super duper cute ice cream spoons! I have never seen a spoon that was more perfect than these for ice cream! This set of 4 ice cream spoons has a long handle and also includes an ice cream sundae resin decoration at the top of the handle. Each one has a different look and appearance. Now, this right here is one of those items that you really don’t need but you love it so much you just can’t pass it up! This Kate Aspen whisk would be my go-to whisk if I had the pleasure of owning it! I love love love this My Ice Cream Spoon and this definitely earned a spot on my wishlist! I am quite certain that I need a dedicated ice cream spoon in my life! Do you need one of these too? Have you ever wanted to create your very own batch of ice cream or frozen yogurt? The Cuisinart ice cream maker will bring on the smiles this summer when you have that ice cream craving. The Cuisinart ICE-21PK is also capable of creating frozen yogurt or sorbet. What flavor of ice cream, frozen yogurt, or sorbet will you be enjoying? Are you curious and interested in having a very unique dessert experience? Well here you go! This dessert maker from Yonanas is capable of whipping up a batch of soft-serve ice cream or nice-cream (vegan ice cream made with ripe bananas. The choice is yours and this Yonanas soft serve maker makes it possible to enjoy ice cream that is dairy-free. The Yonanas 987 soft serve maker is the most durable, strongest, and quietest dessert maker around. If you want to check out a more affordable Yonanas dessert maker check out the Yonanas 902 soft serve maker on Amazon. The DASH Waffle Bowl Maker is a neat little small kitchen appliance that can take your next frozen sweet treat to a whole other level! It is not just for sweets though and that is what makes this appliance so cool! You can get creative with it and make so savory chicken and waffles! And guess what? You can also create taco bowls with the DASH Waffle Maker. It won’t break the bank either! This is an affordable appliance, and it also comes in two other colors: pink and red! Let’s start off this ice cream lovers gift guide with some fun ice cream toppings and ice cream sauces! I don’t know about you but I sure do not enjoy eating boring or bland ice cream. I love to dress up my ice cream with sauces and toppings. Can’t just have a scoop or two… I need the real deal in ice cream sundae form! These caramel ice cream sauces from Fat Toad Farm come in four flavors: Caramel Original, Caramel Salted Bourbon, Caramel Vanilla Bean, and Vermont Maple. What makes these caramel sauces so unique is that they are created with goat’s milk! These Jordan’s Skinny Mixes and Jodran’s Skinny Syrups are a must-try for your next sweet ice cream treat! Best part about these syrups is that they are guilt-free… ZERO SUGAR, ZERO CALORIES, and ZERO CARBS! You can use these syrups to top your ice cream, use them in a milkshake, or get creative and whip up some homemade ice cream! Want to give Jordan's Skinny Mixes and drink syrups a whirl? Save 10% on your first order at Jordan's Skinny Mixes online store with coupon code GIVEITAWHIRL10. Or if you prefer you can shop for Jordan’s Skinny Mixes on Amazon! Extra Dark Chocolate Hot Fudge This flavor here is hands down my favorite flavor from Sanders! Not a fan of weird dyes in your food? Try these naturally colored candy sprinkles from a brand I love and trust… Wilton! This is a 5 pack assortment of candy sprinkles and jimmies, all colored by nature! These are not just for ice cream sundaes either. Top your cake, brownies, and donuts with these. Check out the other products available from Wilton HERE. I just had to add one more candy sprinkles topping to my ice-cream gift guide! Here I am featuring a brand that I absolutely love and am always impressed by… Sweetapolita! Just look at these stunning and eye-catching candy sprinkles! They truly are the greatest I have ever seen. Sweetapolita sprinkles are for the gourmet! Curious about creating your own from-scratch ice cream at home? Check out these ice cream cookbooks from Jeni’s Ice Cream! This book is written by Jeni Britton Bauer and inside you will find some fascinating dessert recipes and ice cream recipes! Ben & Jerry’s ice cream is a pure DELIGHT to eat and puts my mind into a state of BLISS! I want this and I need this book of sweet treats in my life! Ben & Jerry’s Ice Cream & Dessert Book is a bestselling book, and for good reason! This book is jam packed with frozen goodies to please your palate! Last but certainly not least is this variety pack sampler of freeze-dried ice cream. This variety pack contains 5 fun flavors: strawberry, banana, peach, apple, and grape. These freeze-dried ice creams are ready to eat and do not require any freezing. Question time! Tell me what your favorite item is from this ice cream lovers gift guide and then you need to fill me in and tell me what your favorite flavor of ice cream is! I will tell you mine! I spent my entire childhood being obsessed with Superman ice cream followed by mint chocolate chip ice cream. Then one day I tried out cookie dough ice cream and my mind was blown! I believe that cookie dough ice cream will always be my top favorite! For me, the combination of some vanilla ice cream with those little cookie dough pieces mixed in is pure bliss for me! Modern Cone Review – St. Clair Shores Ice Cream Shop – Unique Ice Cream Creations! Want to see more fun ice cream goodies? Shop my AMAZON STORE or check out my favorites below! This entry was posted in Friday Faves, Shopping Guide and tagged ben & jerry's, candy sprinkles, caramel, cheat day, cookbook, Fat Toad Farm, freeze dried ice cream, frozen yogurt, fudge, ice cream, ice cream maker, ice-cream, Jeni's Ice Cream, Jordan's Skinny Mix, Jordan's Skinny Syrups, Kate Aspen, nice cream, rainbow, Sanders, sorbet, Sweetapolita, waffle cone, whisk, wilton, Yonanas. Bookmark the permalink. I have the waffle maker but those ice cream bowls look adorable. Love all these ideas. A waffle bowl maker?? What? I love it! I love ice cream and I’d take any one of these gifts! These are great! Yonanas Soft Serve Maker is my pick from this list. A Gift for myself this summer! I have a Cuisinart ice cream maker I have not used in a while! I think I will be braking it out and buying that Ben & Jerry’s ice cram book!!!!!! My husband loves ice cream! He would go crazy for an at home ice cream maker as a gift. Great ideas!